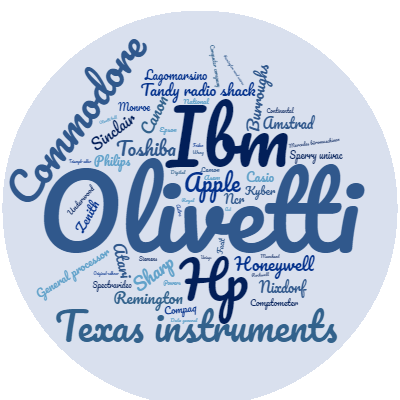 Titolo: OUR IBM® PC XT "MIRROR IMAGE"
How would you like a system that does everything an IBM PC XT does—but costs thousands less? Now the Tandy 1200 HD is only $1999 (was $2999 in Cat. RSC-14). That's $2396 less than the XT! If you're already using an IBM PC, the Tandy 1200 HD lets you expand for less—and you can continue using the same software designed for the PC. The Tandy 1200 HD is compatible with expansion boards designed for the PC, too. 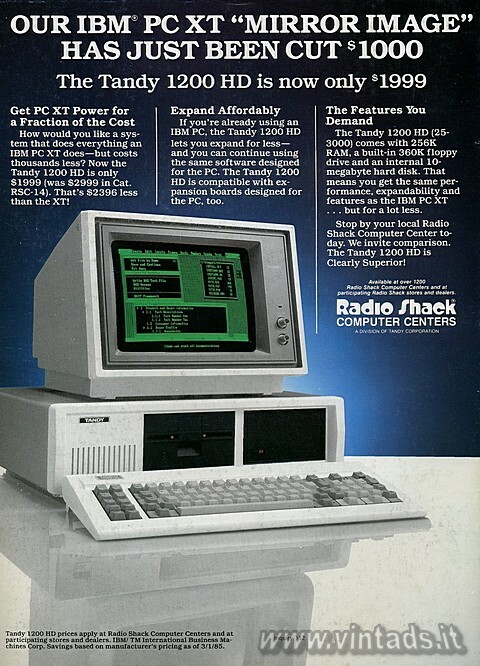 The Tandy 1200 HD (25-3000) comes with 256K RAM, a built-in 360K floppy drive and an internal 10-megabyte hard disk. That means you get the same performance, expandability and features as the IBM PC XT ... but for a lot less. Stop by your local Radio Shack Computer Center today. We invite comparison. The Tandy 1200 HD is Clearly Superior! Available at Over 1200 Radio Shack Computer Centers and at participating Radio Shack stores and dealers.